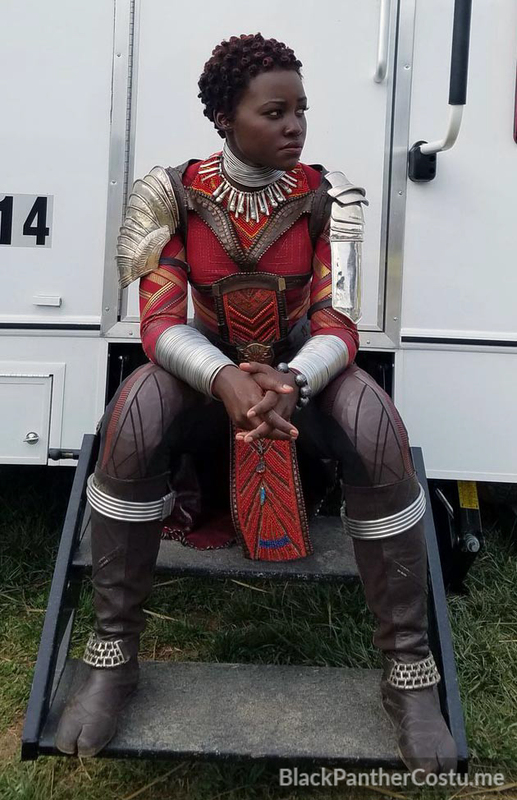 Nakia. 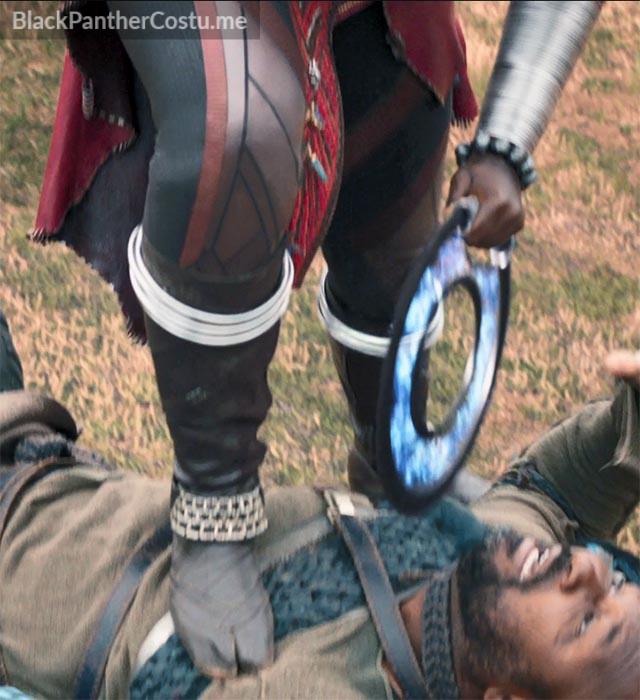 A War Dog from the River Tribe. 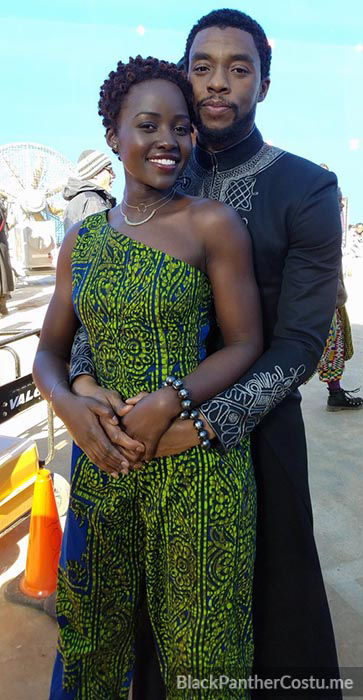 Love interest of T’Challa. 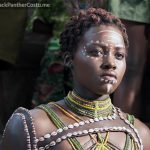 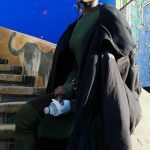 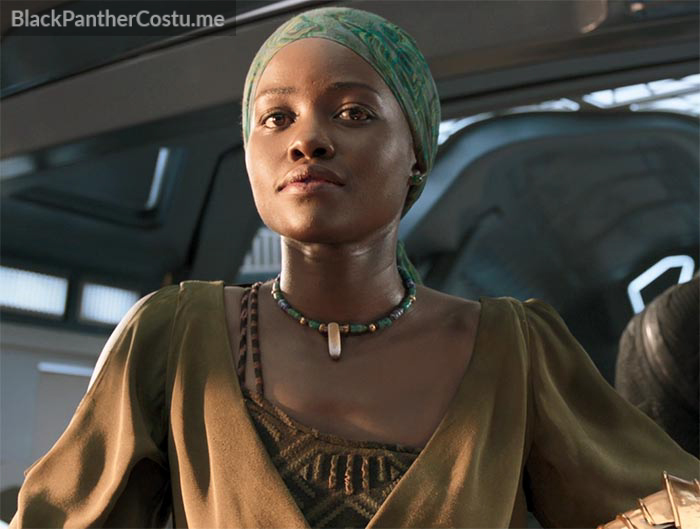 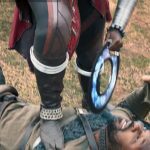 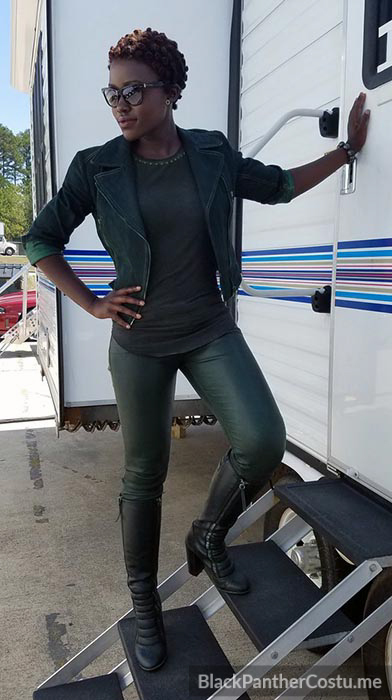 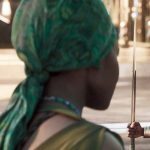 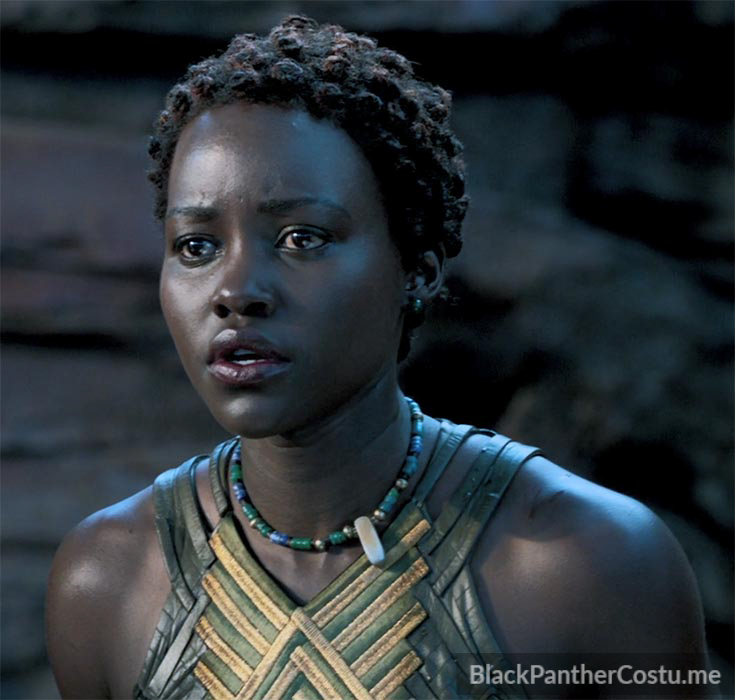 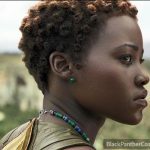 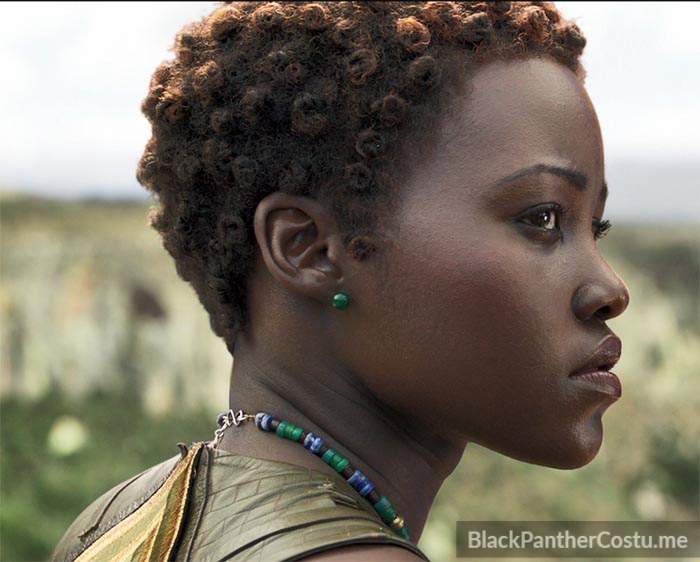 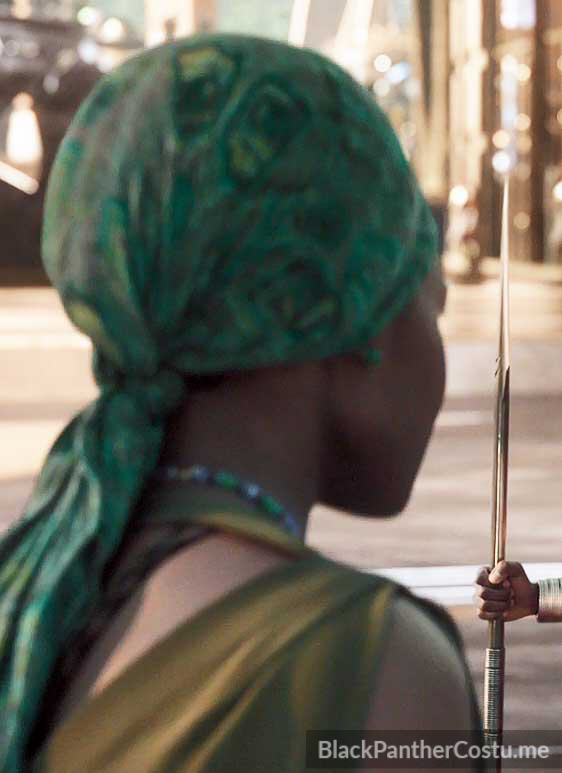 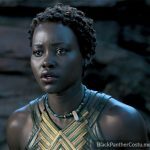 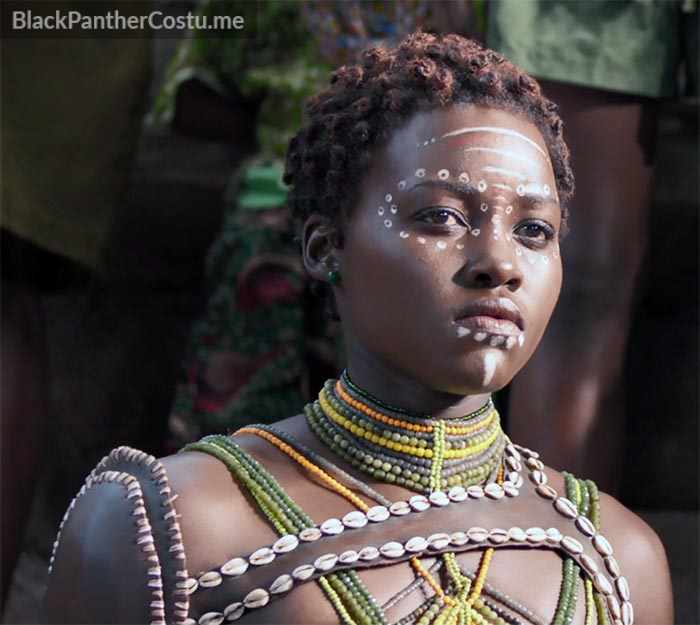 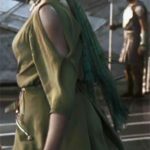 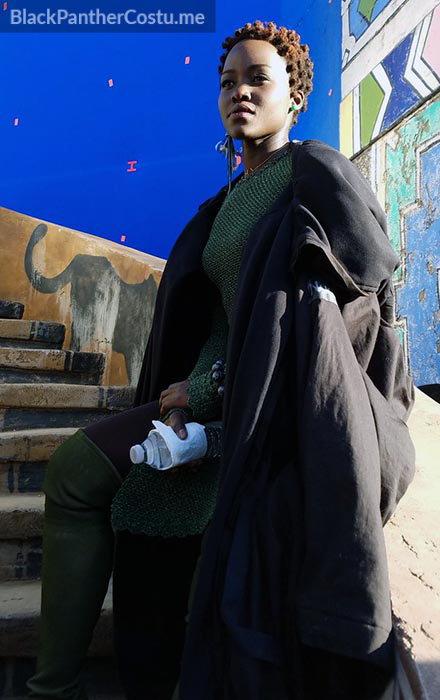 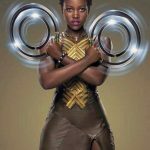 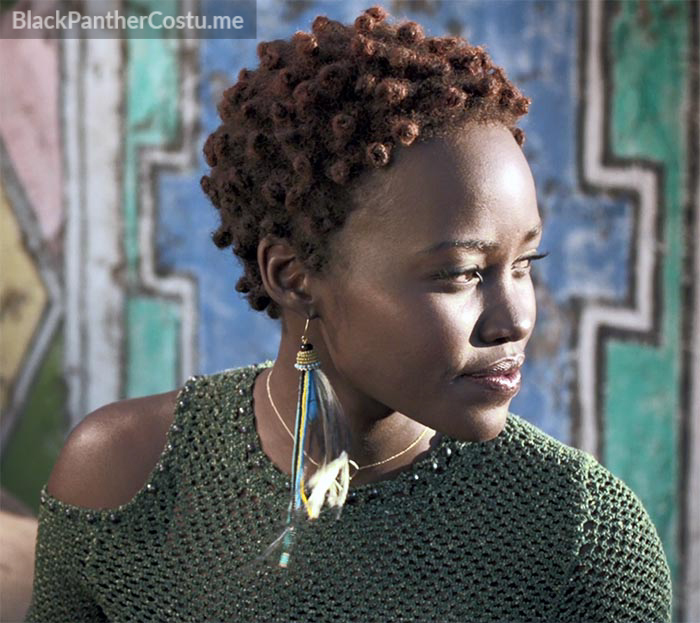 “Nakia has a range of disguises throughout “Black Panther” that make her particularly fascinating. 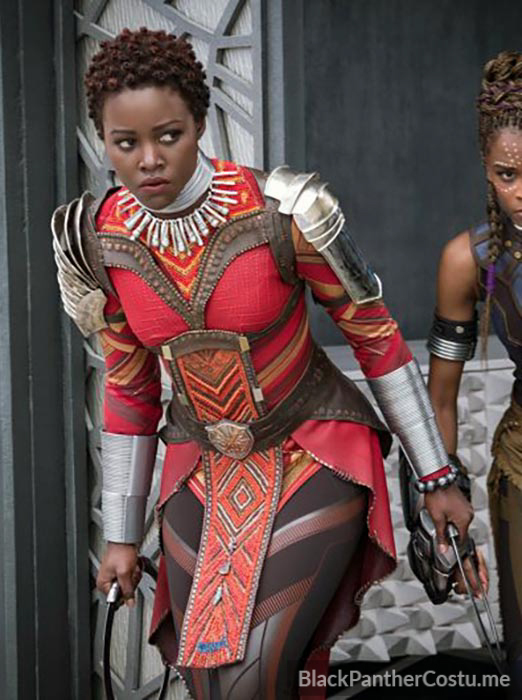 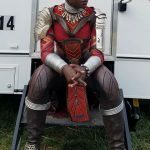 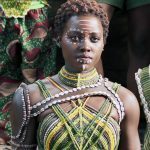 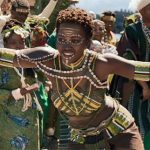 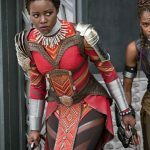 “We see her in Nigeria in the beginning with ripped jeans; we see her at the Warrior Falls and she wears her River tribe costume; we see her in the CIA with leather pants and jean jacket; we see her in a casino and she portrays an African princess in a long gown. 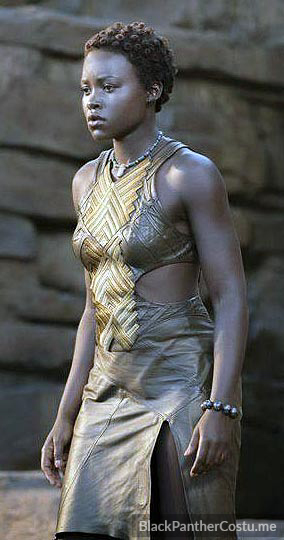 We covered the layers of women with their toughness and softness at the same time,” said Carter. 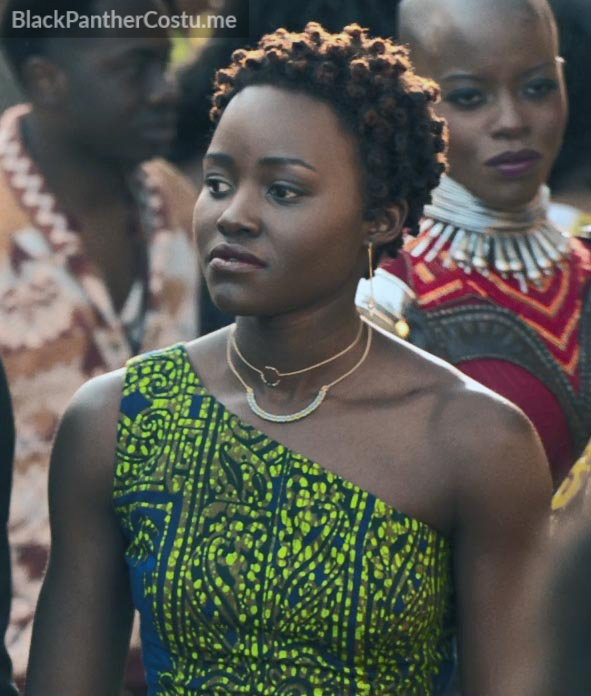 River stone necklace to signify her tribe. 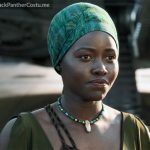 Head cover is called a khimar. 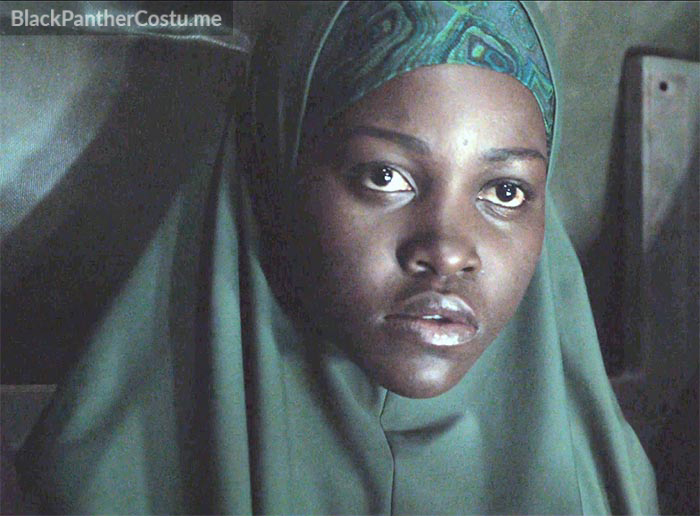 Under the khimar is a scarf tied around her head. 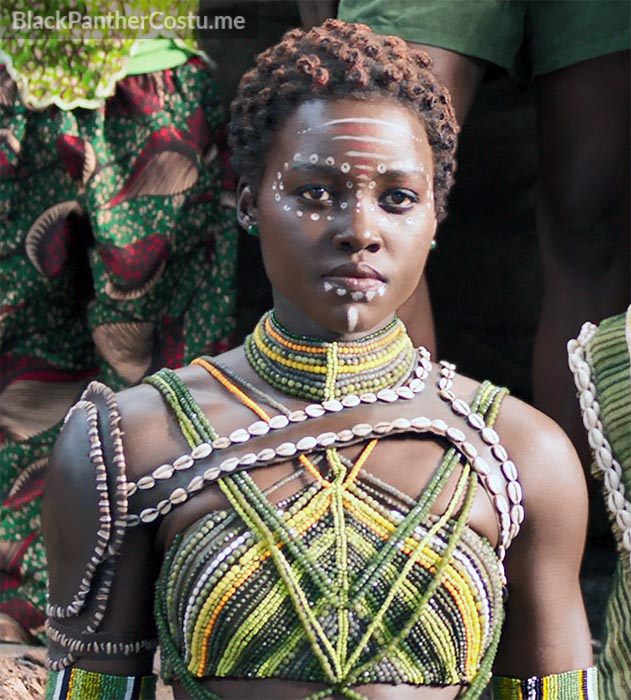 Costume inspired by the Suri people (river people of Ethiopia). 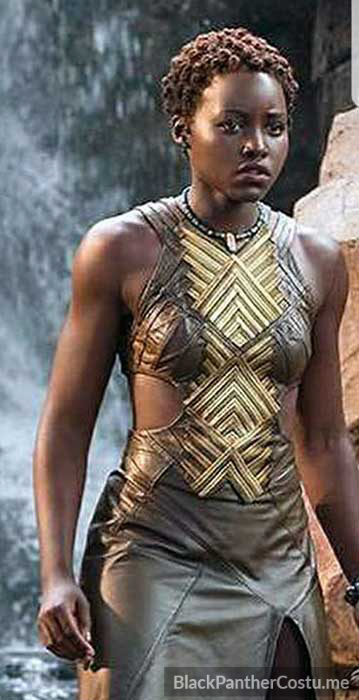 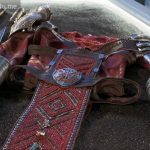 Warrior harness with cowrie shell border. 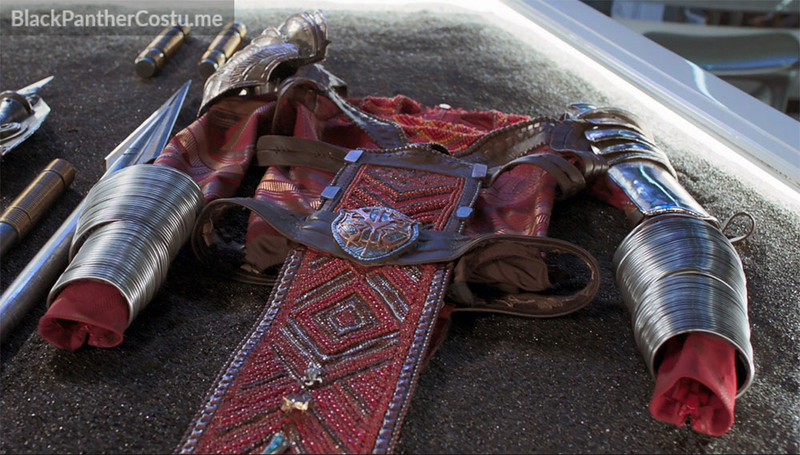 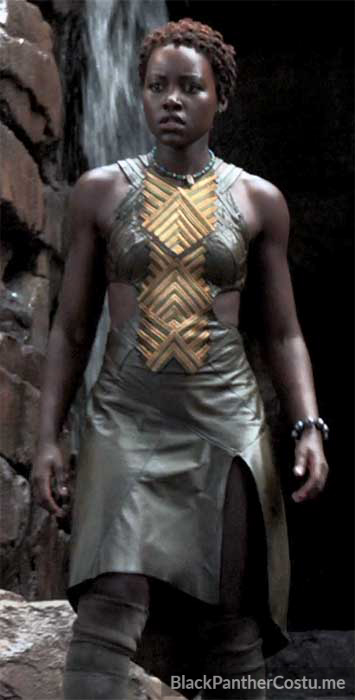 Buy this Nakia replica dress. 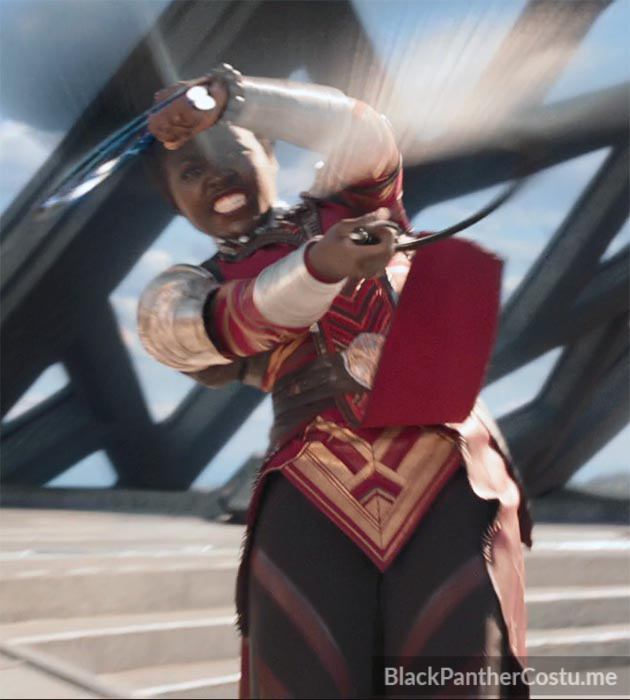 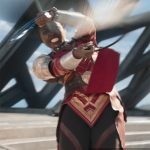 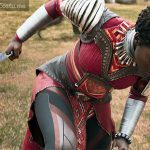 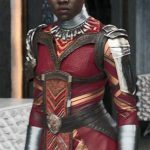 See the Dora Milaje Page. 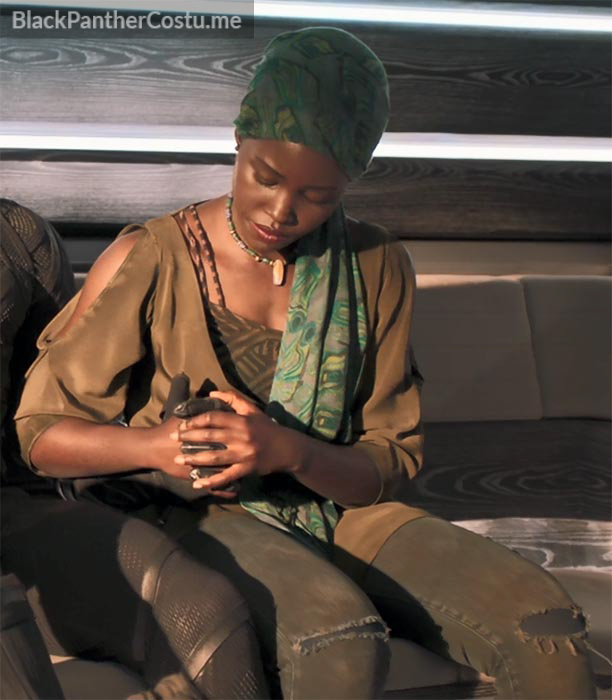 “Nakia is a war dog. 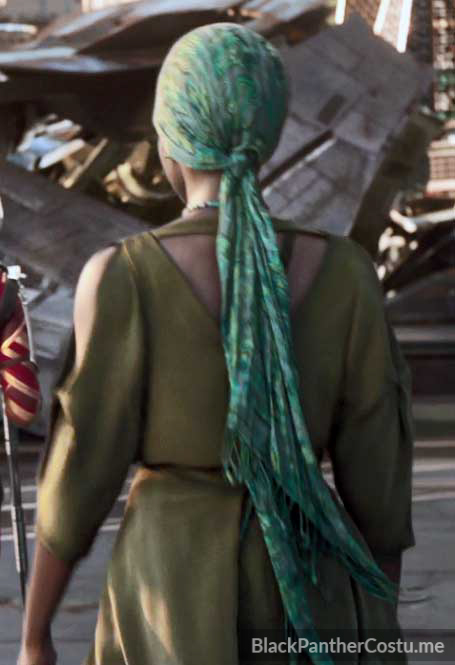 She’s an operative; a spy, so she has the most looks of everyone in the film. 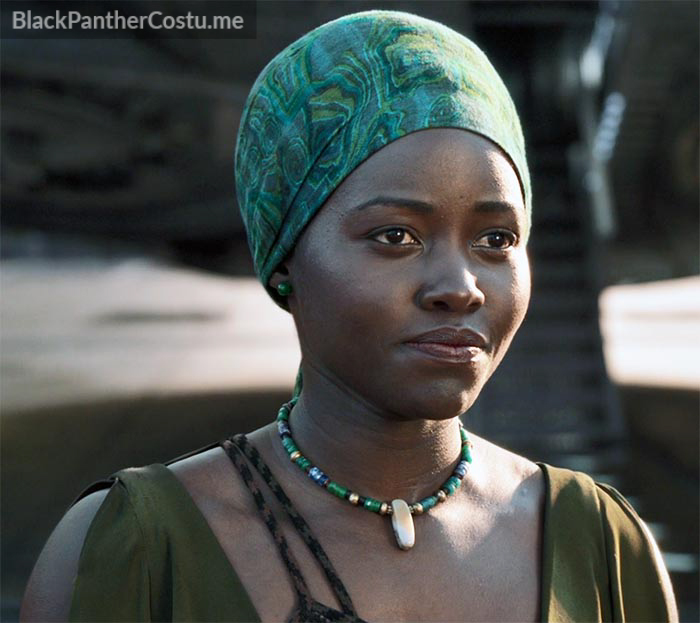 She goes undercover as a Nigerian captive in the hijab, but then I had to quickly get her out of the hijab and give her a costume that looked like she could’ve been hanging out in any city in Africa. 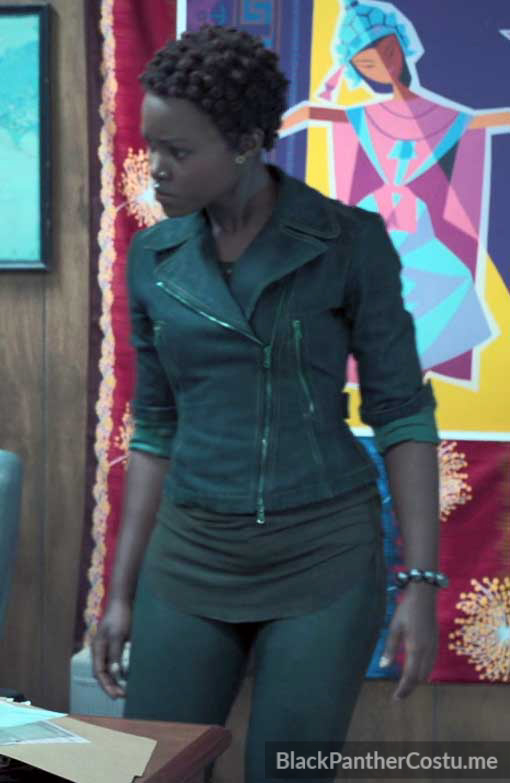 She had to look like she could walk down any street and blend in. 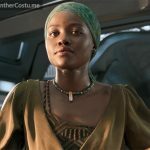 When we see Nakia at the airstrip, we see her in jeans and a flowy top and a scarf. 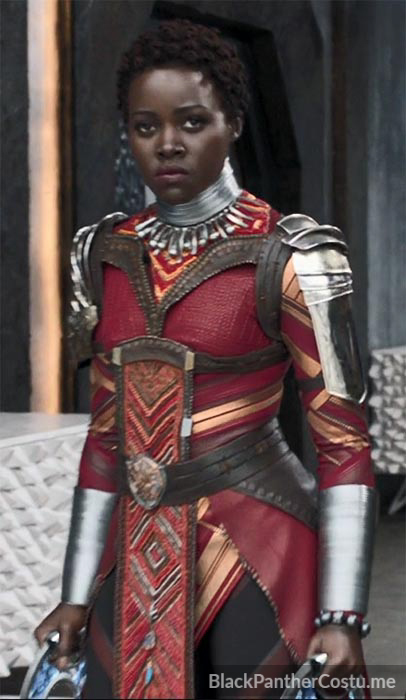 Then we see her at Warrior Falls in her traditional costume for the traditional ceremony as the River Tribe’s primary fighter. 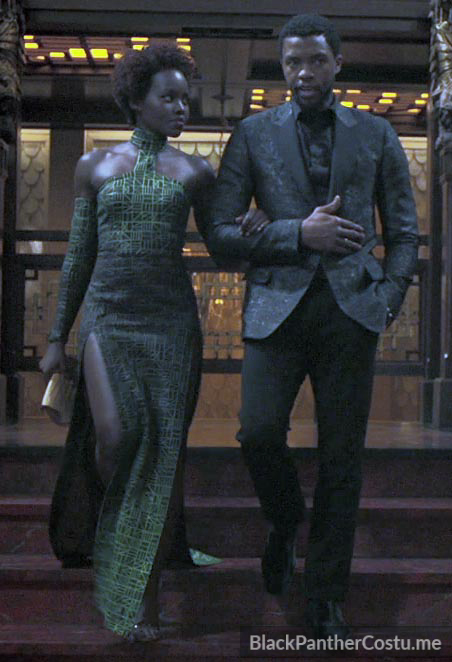 Then we see her in her casino dress. 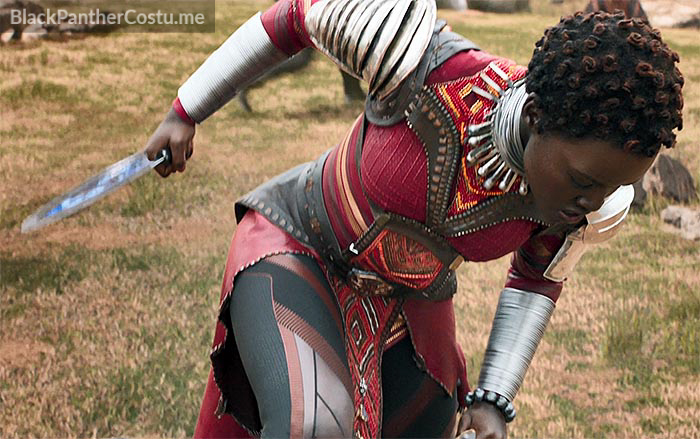 She has a lot of different costumes. 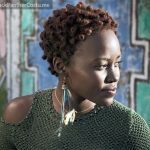 “Nakia’s more traditional outfit is inspired by the Surma and the Suri people of Africa. 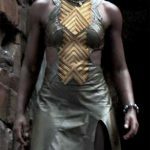 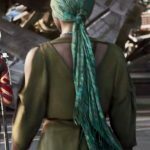 Nakia’s tribe are fisherman, so some of her designs are based on different cultures, nations and people of Africa who live near the water. 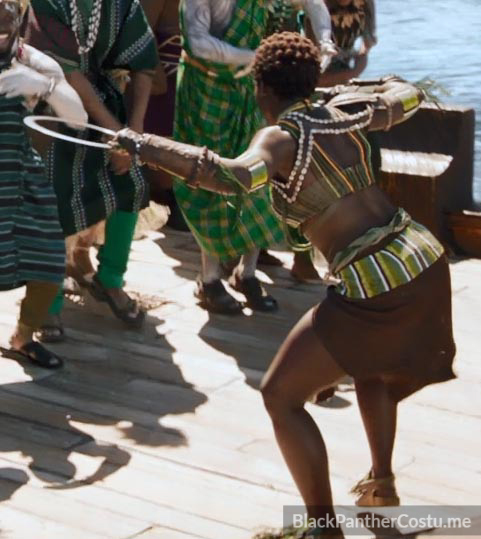 Hence Nakia’s tribe is called The River Tribe. 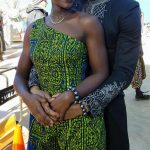 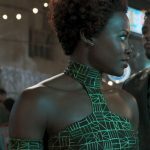 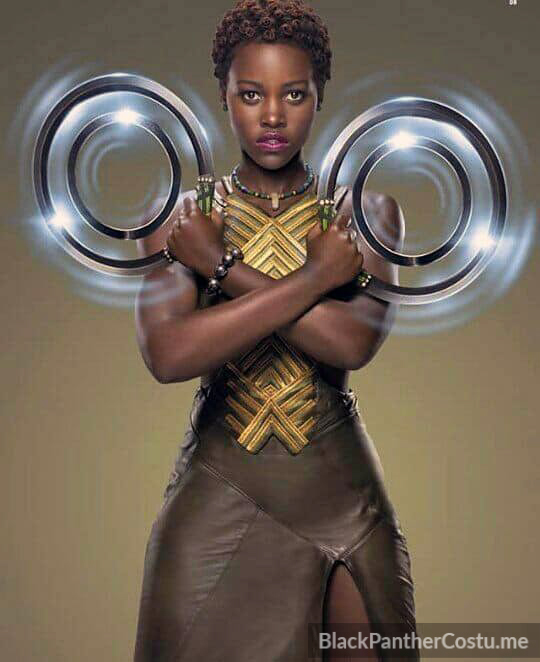 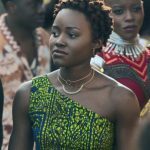 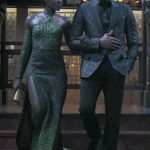 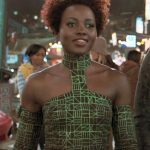 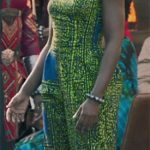 “Nakia’s casino dress was based on a Kente pattern. 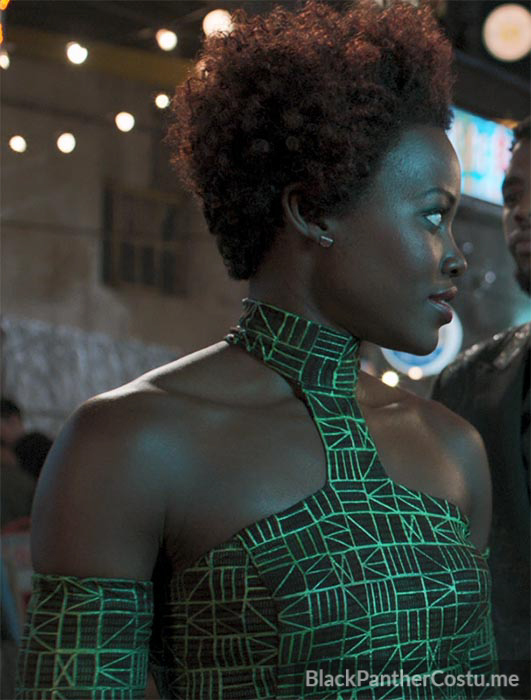 When we see her in this dress, it’s very ‘Bond Girl’. 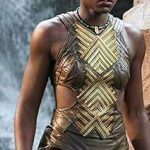 “We used the simple line-work from the Kente pattern and we had it printed on the same type of eurojersey that we used for the Panther suit. 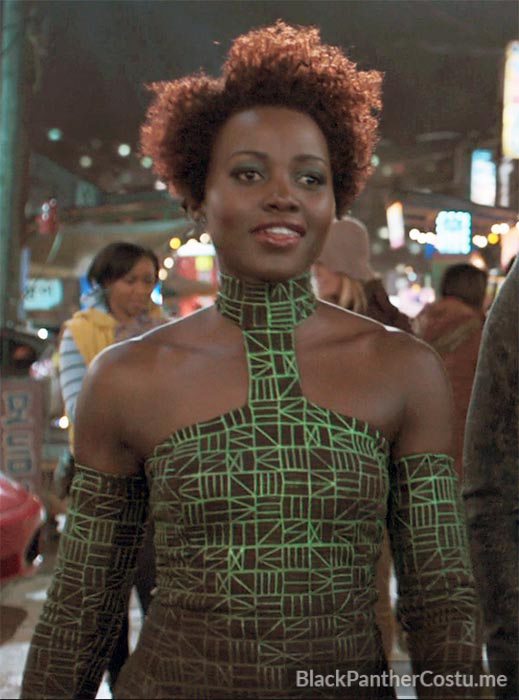 Once we had an all-black dress printed, we hand-painted it so that it would have an ombré effect.